Ears, eyebrows, nose, ears, chest. Is characterized by redness, flaking and irritation of the areas affected. 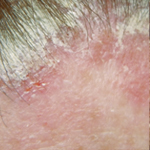 The result is a pinkish, edematous aspect, covered with scabs and yellowish desquamation of the affected skin. This condition, known as cradle cap, can also affect babies and small children up to 3 years, and unlike its adult version is characterized for being harmless and temporary. Sebovalis offers a shock treatment or maintenance treatment to control dandruff and seborrheic dermatitis. Sebovalis provides the benefit of a global treatment without risk of contraindications, since the prolonged use of topical corticoids produces undesired side effects.